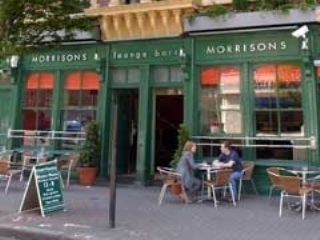 Morrisons is an old-fashioned bar with a stylish wooden interior and some attractive snugs if you're feeling private. Nice lunches are served and there are frequent specials. Morrisons latest jewel has to be the opening of The Beat Suite. This club is dedicated to bringing the latest tunes and DJs to Belfast, as long as they're hip-hop-orientated. Don't be alarmed by the tight squeeze, it seems worse than it is at first! Past guests have included Mr. Scruff and Christian & Rae. On Thursday and Sunday you can catch up with some local band talent; Sunday acts are usually more chilled out and of the folk and jazz variety. Morrisons is a handy bar to get to and is perhaps a good place for some celebrity spotting, as the BBC is over the road. Have you got Google Earth on your computer? If so, then download the Google Earth view of Morrisons. Is this the wrong position for Morrisons? If you think so, then modify its position. Click / Tap the button above to get directions from where you are to Morrisons. I found the bar staff extremely rude to a friend I had invited over from England. Having ordered a bottle of Coors light, the bar man poured a pint of Coors and refused to change the drink when mt friend politely asked him to, the bar man then took the drinks from my friend and would not let any other bar staff serve him. I was very embarassed and will not be back! Full marks to Morrisons on the day of the Carling Cup Final. Everyone in the bar was treated to a (substantial) free meal at half time. A great day was had - brilliant atmosphere - a very good place to watch football/sport as the screens are well placed for clear viewing. And you can actually HEAR the commentary. Only thing spoiled the day was the fact that the scumbags won on penalties. In the year 2009 people expect at very least basic hygine,I called in recently to sample there food but after using the rest room (very dirty and below basic standards)and witnesing the staff not even washing there hands I cancelled the food and brought this issue to the attention of the manager.The manager had no interest in my opinion and to add insult to injury I was then intimidated by one of the doorstaff who came accross of having an IQ of about 3.I strongly recommend not using this bar as they dont deserve your custom. 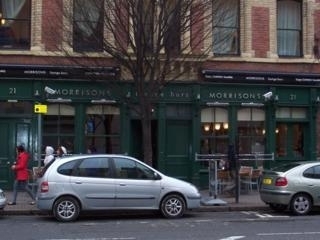 the best bar of Belfast! Good bar but the toilets are always in a poor state every time I have been. jus had r engagment party upstairs n morrisons las nite brill nite evry1 commented on the decor and how well looked after the place was. and a big shout out 2 shaun the bar man aka shaun the sheep best bar man n belfast lovely fella!! Great bar with a mixed crowd - toilets were grand too. The only problem I had with this bar was the 18th birthday celebrations that was being upstairs, come on kids stealing ur drink just not fun at all. Needless to say after a few choice words and words with the bar staff they were removed. Been to this bar many times and would def go back again. Door staff are friendly and variety of drink is good too! Well done! Decent bar, probably serves the best pints in the City Centre. It gets a nice crowd, respectable but not posey, and the staff are friendly as well!!! The male toilets have to be the worst in Belfast - absolutely bogging. Apart from that, Morrisons is a decent bar.